You'll find other spiderweb photos here. You'll find plenty of autumn color here, and there are all sorts of farm landscape photos here. If you feel like revisiting summer haying season, just click here. 10/26/06: Did Someone Order More Fall Color? © 2007 FarmgirlFare.com, the award-wining blog where Farmgirl Susan shares stories & photos of her crazy country life on 240 remote acres. October is my favorite month on the farm. It always feels like we're being rewarded for surviving another Missouri summer. Things weren't quite so colorful in my kitchen garden this morning, though. They were more like frosty white. You'll find plenty of autumn color here, and there are all sorts of farm landscape photos here. If you'd like to see how much our scenery changes from season to season (and sometimes even from day to day) check out the Same Scene, New View photos here. We've had rainstorms and blustery afternoons and days in the 50s instead of the 80s. It finally feels like fall. 10/23/05: Are You Smiling Yet? Are you a beginning bread baker? You might find my Ten Tips on How To Bake Better Artisan Breads at Home helpful. It occurred to me that you might be interested in trying this bread. We tried making tomato basil whole wheat sourdough last week with tomatoes (as water) and roughly chopped basil leaves. I'd be happy to send you the percentages if you are interested. It just seemed like something that was right up your alley. It was really quite delicious. Simply sliced with some smoked cheddar cheese it made a delectable sandwich. Yes, it was definitely right up my alley, and it really was quite delicious. Even though they've been baked, you still get that fresh tomato flavor. Many thanks to fellow breadies Joel and his wife (in the wonderful state of West Virginia!) for generously sharing their recipe. What immediately piqued my interest about this bread was that it uses chopped fresh tomatoes in place of water. Such a brilliant idea. My only concern was what color it would turn out. I used to make savory feta cheese & sun-dried tomato scones when I had my little bakery cafe in Northern California, and while quite tasty, they were an odd sort of pinkish orange. Using whole wheat flour, which bakes up darker than white flour, easily solves this problem. Joel's version calls for 100% whole wheat flour, but I used 50% whole wheat flour and 50% bread flour. The tomatoes don't need to be peeled, which is always good news in my book. If you don't have any sourdough starter handy, I'm thinking that you could try replacing all or some of the water with fresh tomatoes in pretty much any bread recipe. Creating a sourdough starter takes several days but isn't difficult to do. There are many different types, and recipes for them abound. I made my French levain starter several years ago using the instructions in Daniel Leader's Bread Alone, one of my favorite bread books. I also love Local Breads, is Daniel's latest bread book, and am looking forward to making some of the European starters in it hopefully soon. Joel's starter is 50% flour, 50% water, refreshed about 6 to 8 hours before using it. I simply refreshed my 50%/50% levain starter like I do when I bake pain au levain by adding flour to the entire batch and then letting it sit on the counter overnight. I think whatever sourdough starter you have should work in this recipe. A digital kitchen scale makes baking and cooking so much easier. I love my 11-pound Oxo Good Grips scale (which was voted #1 by America's Test Kitchen for good reason) and often use it several times a day. The pull-out display is awesome, and it's also great for weighing postage. As always, I urge you to seek out local and organic ingredients, as they really do make a difference. Combine the sourdough starter, tomatoes, and basil in a large bowl. Stir in the whole wheat flour and most of the bread flour. Mix until roughly combined, then let rest for 20 minutes. This is the autolyse. At this point, you can add up to 4 ounces (1/2 cup) warm water if your dough seems like it's going to be too stiff (it will depend on how juicy your tomatoes are). Or you can add more chopped tomatoes; I didn't have any more or that's what I would have done. How slack (wet) you want the dough is up to you. With the extra 4 ounces of water, mine ended up so slack it was sticky and hard to work with, and the loaves really spread out while proofing despite using a couche. The bread still came out great, but I'll make a slightly stiffer dough next time. Turn the dough out onto a floured work surface and knead in the salt. Continue kneading for 10 to 15 minutes until the tomatoes are incorporated and the dough is soft and smooth, adding more bread flour as needed. Place the dough in a straight-sided food grade plastic container with a snap-on lid and let it rise (ferment) until it has doubled in size, about 2 to 4 hours. You should be able to push a floured finger deep into the dough and leave an indentation that doesn't spring back. Cover a baking peel (also called a pizza peel) with unbleached parchment paper (this is wonderful stuff) and sprinkle it with flour. Turn the risen dough out onto a lightly floured work surface, flattening gently with your hands to break up any large air bubbles. With a bench/pastry scraper (these are so handy; I use mine all the time) or large knife, cut the dough into two equal pieces and shape them into rounds or logs about 12 inches long. An hour before baking, place a baking stone (the secret to crusty breads and amazing pizzas) on the middle rack and heat the oven to 500 degrees. Place the loaves smooth side up on the parchment paper, about 2 inches apart. Make a couche by lifting the parchment paper between the loaves, making pleats and drawing the loaves together. Tightly roll up two kitchen towels and slip them under the parchment paper on the sides of the two outer loaves to support and cradle them. Lightly dust the tops of the loaves with flour and cover them with plastic wrap or a damp tea towel (my preference). This nifty parchment couche trick comes from Local Breads. Alternatively, you can use a traditional, well-floured canvas couche as I did above. Let them proof until almost doubled in size, about 1 to 2 hours. If you press a floured fingertip into the dough it should spring back slowly. Quickly score the tops of the loaves with a blade or sharp knife (I use a large serrated knife) and slide them, still on the parchment, onto the baking stone. Bake until the loaves are dark golden brown and the bottoms sound hollow when tapped, about 25 to 30 minutes. Try to let them cool for at least 40 minutes before tearing into them. Store in a resealable plastic bag at room temperature or freeze. Baking notes: I only had enough garden tomatoes left to make this recipe once, but I'll be experimenting with it more next summer. I'm thinking the tomato flavor could be enhanced even more with the addition of a few slow roasted tomatoes, a speciality of my food blogging pals Kalyn and Alanna. Maybe next year I'll finally talk myself into turning the oven on for hours and hours during the mid-summer heat to make some. They both keep assuring me it's worth it. Still have more flour left? 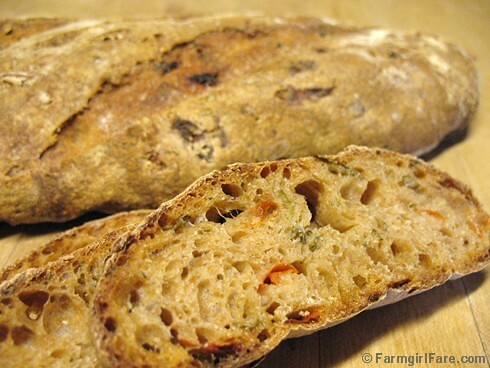 You'll find links to more scumptious bread recipes in the Farmgirl Fare Recipe Index. , where Farmgirl Susan shares recipes, stories, and photos from her crazy country life on 240 remote Missouri acres—and there's always at least one sourdough starter in the fridge. I took this photo back on the 8th, when it seemed like nearly all the trees around here were determined not to give up their green this year. But a few days ago some much needed rain nudged them toward their autumn duties, and the true colors of the season are finally showing through. It always amazes me how quickly the entire landscape can change. We're still having warm days in the 80s, though, so now everything looks right but feels weird. Is autumn happening correctly in your part of the world? Many of you know that last June our beloved New Cat died suddenly, most likely from a poisonous snake bite. And while my heart still aches for him, no one was more brokenhearted by New Cat's death than J2, who was his constant companion. I've never known two cats who were better friends. The two of them lived together in The Cat Cabin, and each night they curled up on their pink wool bed. I explained to J2 that I understand how lonely he is and assured him that a new feline friend would be bunking with him soon. I have no doubt that another cat in need of a home will find us. They always do. In the meantime, the height of snake season is not when you want to bring a new cat onto a farm. Enter Patchy Cat. Leave it to our efficient Farm Boss to spot not only a fellow feline in desperate need of a pal, but an available spot on a cozy wool bed as well. In seven years, The Cat Cabin is about the only place on the farm I hadn't ever seen Patchy Cat. J2 is thrilled that he's moved in. You'll find plenty of farm cat photos & cat stories here. © 2007 FarmgirlFare.com, the feline loving foodie farm blog where Farmgirl Susan shares stories & photos of her crazy country life on 240 remote acres—and you can never have too many cats. Tomatoes, peppers, cilantro, and scallions: making a memory even tastier. When I was a kid, one of the things we often did while on vacation was to go on factory tours. Except for a few, like the Volkswagon factory in Germany, these places usually manufactured or processed some sort of food. To this day, details from those visits make up some of my clearest childhood memories. There was, for example, the pineapple factory in Hawaii where pineapple juice came out of a drinking fountain. And the tuna factory where two of the ladies cutting up large whole fish on a long assembly line smiled and pointed at me as I pinched my little nose in an attempt to escape the overpowering scent of tuna. I remember watching thousands of Hershey's chocolate kisses riding stair-step conveyors at the Hershey factory in California, and being disappointed when the tour of the "real" factory in Hershey, Pennsylvania turned out to be nothing more than an amusement park type ride. As an adult, I happily toured the Ben & Jerry's ice cream plant in Waterbury, Vermont not once but twice. I tasted ice cream right off the assembly line and saw the original note sent to Ben & Jerry from a fan—written on an ice cream carton lid—suggesting they create a flavor called Cherry Garcia. I also discovered that through much experimenting in the early days, Ben & Jerry determined the best way to break up Heath Bars into the perfect sized chunks for their Heath Bar Crunch ice cream was to drop a case of the candy bars onto the ground from a stepladder. They employ a slightly more advanced technique now. While touring the Jelly Belly jelly bean factory a few years ago, my mother learned that the flavored outside layer on each jelly bean is applied by tumbling them around in what look like gigantic clothes dryers. And at the on-site gift shop, Jelly Belly "seconds" are packaged up and sold as Belly Flops. After a tour of the memorabilia-filled Coca-Cola headquarters in Atlanta, Georgia, a friend of mine had a chance to taste several flavors of soda only available outside the U.S. Factory tours have become quite popular, especially with families, because they're interesting, usually kid-friendly, and often free. There are even books devoted to the subject. Watch It Made In The U.S.A.: A Visitor's Guide To The Best Factory Tours and Company Museums by Karen Axelrod and Bruce Brumberg promises to "help you and your family discover information about more than 300 ordinary and extraordinary products most of us take for granted." While factory tours are fun for people of all ages, I do think the fascinating glimpses they give us into what often seem like whole other worlds have the most profound effect on children. Every once in a while Joe still fondly recalls the tour of a potato chip factory he took with his Cub Scout troop some forty years ago. The most memorable factory I've ever visited was actually the one closest to home. It was a tortilla factory owned by the mother of my very first friend (we "met" when we were just a few months old), and one year she treated our Brownie troop to a personal tour. We saw enormous vats of masa, watched tortillas travel along what seemed like miles of conveyor belts, and were given handfuls of warm tortilla chips by the ladies running a machine that magically coated the chips with nacho flavored seasoning. Even without the tortilla factory, my friend's mother stood out from the crowd. She put an antique wooden carousel horse with a tail made from real hair in the living room, zipped around in a classic Porsche roadster, and once fed us French toast for dinner. They were a family of expert skiers and had a snow cabin full of bunk beds up in the mountains. She was the only mother in the neighborhood we called by her first name, and her entire face lit up when she smiled. She also spent a lot of time devising ways to get people to eat more tortillas. Long before the days of desktop publishing, she and her mother put out a newsletter called Tortilla Talk, which they filled with interesting recipes using tortillas and tortilla chips. Back in early August, the first ripe tomatoes from the garden and an ongoing cottage cheese kick prompted this e-mail message to my mother: What was that stuff you used to make a long time ago with cottage cheese and salsa or tomatoes or whatever? And what did you do with it once you made it—just eat it with chips? The recipe for 'Gayle's Caliente Cottage Cheese Dip' arrived in my inbox soon after, and I wasn't surprised to find that it was from Tortilla Talk. Below it my mother had added, Gayle could be Mrs. Pete Wilson. I've since learned that the recipe did indeed originate in the (now) former First Lady of California's kitchen. I took the original six-ingredient recipe, applied my More More More motto to it, and came up with this colorful, veggie-packed version I've been devouring ever since. It's always nice when something that's so good for you tastes so good, too. It's even low fat. So what memorable factory tours have you been on? The more color, the better is what I always say. Gayle's recipe called for 3 dashes of Tabasco and a 4-ounce can of diced green chiles, which were a staple in many pantry cupboards in our neighborhood when I was growing up. I opted to use a chopped fresh jalapeno pepper instead, but canned chiles would add a nicely flavored kick. Using yellow or orange tomatoes and/or sweet peppers will make the dip even more colorful. As always, I urge you to seek out local and organic ingredients whenever possible. They really do make a difference. Mix all the ingredients in a medium bowl. Feel free to add even more veggies if you like. The original recipe says to chill at least 3 hours before serving, then pass with tortilla or corn chips. Waiting a few hours, or even overnight, does improve the flavor, but, as usual, I nibbled away while I chopped and mixed, and it tasted just fine to me. It's funny, though, how you can add so many ingredients to a container of cottage cheese and have it all fit back in the original container. This dip will keep two to three days in the fridge. Turn it into instant coleslaw! Personally I think this dip tastes great just plunked in a bowl and eaten with a spoon, which is the way I've enjoyed most of the six or so batches I've made over the past few months. It's a nice (and healthier) change from plain cottage cheese. If you haven't used up all your cabbage making my Mexican Jumping Bean Slaw, simply combine some Fiesta dip with shredded cabbage for another new twist on coleslaw. You could also use it to fill an omelette or top a baked potato. Or make a quick vegetarian burrito by stirring in a can of black beans and a can of corn into either the plain dip or the coleslaw and wrapping it all up in a flour tortilla, perhaps with an extra sprinkling of chopped fresh cilantro. You could probably even spread some on a sandwich. Can you tell I love this stuff? © FarmgirlFare.com, the always on tour foodie farm blog where Farmgirl Susan shares stories & photos of her crazy country life on 240 remote acres. My life in the city was ruled by the clock. Now it's ruled by the sun. Animals don't wear watches, and they don't stick to fixed timetables. The system they live by is simple: when it's light you wake up, when it's dark you go to sleep. In between you eat as much as you possibly can. Their lifestyle, in turn, determines ours, because it would probably be easier to knock the earth off its axis than convince a flock of sheep in July that it's time to go to bed at six o'clock. I spend my days acutely aware of sunrises and sunsets. The other thing I now pay attention to is where the sun is actually shining during the different seasons. Sometimes this is for practical reasons; it's handy, for instance, to know when the laundry line is going to be in the sun or when the greenhouse will be in the shade. Other times I'm reminded of the constantly changing angles of the sun when I come upon a scene like the one in the photo above. There are only a few misty mornings each fall when the light hits this tree in such a way that the big branch on the right appears to extend down to the ground. I captured it last year, then forgot all about it until the other day when it started happening again. I love these comforting little reminders of how some things really do stay exactly the same from one year to the next. 10/1/06: Bodyguard or Nanny Bear? The world is his scratching post. You'll find lots of Donkey Doodle Dandy photos here. And the story of how Dan came into my life is here. Out of curiosity I did a quick count this morning and was surprised to find that my collection now includes well over 150 heart shaped rocks found on and around the farm. It's hard to believe that two and a half years ago I had less than twenty, though I'm not nearly as picky as I used to be. Most of the hearts aren't perfectly shaped, but then again neither is life. And when grouped together it's obvious that they're all hearts. They range in size from about ten pounds (it marks the cat cemetery in the garden) to barely half an inch across. They're starting to take over the place. I recently came across this big heart rock in the middle of the fenced pasture across from the barn. It was sitting there on the struggling grass and sheep pellets like a meteorite that had dropped out of the sky. You find lots more photos here, along with stories that help explain why a bunch of old rocks holds such a special place in my heart.